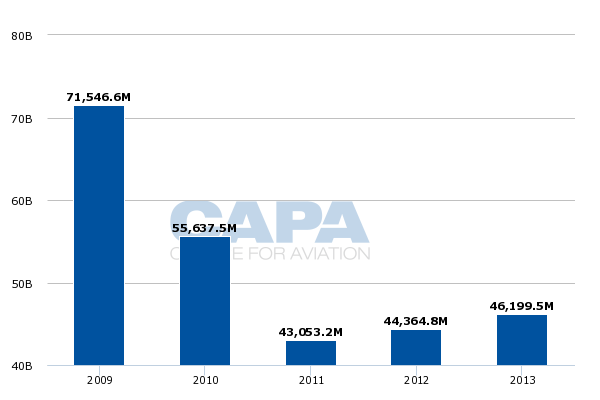 Japan Airlines' international growth in recent years has been focused on new services, such as to Boston and San Diego. But now Japan's second largest international airline is reviving routes it cut during financial difficulties. JAL has re-instated its second daily New York service and will re-open an Osaka Kansai-Los Angeles route in Mar-2015. That will be JAL's only long-haul route outside of Tokyo, and the carrier has mooted re-opening Osaka Kansai-London Heathrow as well. Also under consideration is resuming Sao Paulo service, likely via New York. JAL is looking to grow international services as its domestic market faces limited growth prospects. And with 30 787s on order, and later A350s, there are aircraft that will need new routes, even if many orders are for replacement. The drawback to international growth is financial pressure. JAL in 1Q2014 (the three months to 30-Jun-2014) fared much better in its international network than All Nippon Airways, whose rapid expansion at Tokyo Haneda created over-capacity that weakened load factors and yield. JAL's challenge will be to gradually build international services, but further capacity should still dampen international financial performance. However, with margins being in the double digits, there is room to give in exchange for larger profits. JAL will resume Osaka Kansai-Los Angeles service on 20-Mar-2015. JAL last served the route in 2006, ending it as financial difficulties mounted. (During JAL's bankruptcy restructure a few years later the carrier ended a tranche of routes.) But this is not entirely a return to the old JAL: whereas the route was served by a daily 747-400 seating about 300 passengers, JAL in 2015 will deploy its much smaller 787-8, with the new configuration seating 161 passengers. The Kansai-Los Angeles route complements JAL's daily Tokyo Narita-Los Angeles route. Los Angeles has the US' largest population of Japanese. JAL says the route will be its first new international service at Kansai in six years. The service will also be JAL's only long-haul route outside of Tokyo, excluding leisure flights to Hawaii. (ANA has no long-haul routes outside of Tokyo.) JAL has been under pressure to fly internationally from cities other than Tokyo, but the volume and economics of Tokyo have kept its priority on Japan's capital. Leaving the Kansai-Los Angeles market un-served could see the entry of a fifth freedom carrier using the fifth freedom rights Japan has dispensed. Some jokingly called for JAL to be re-named "Tokyo Airlines". It is not uncommon for airlines to focus long-haul routes from their country's main city (British Airways from London, Air France from Paris, China Airlines from Taipei, Thai Airways from Bangkok) but in Japan there are sizeable other cities with concentrated populations. In JAL's defence, it has mostly been foreign carriers that have launched long-haul flights to Japan's smaller cities (Delta to Nagoya, Finnair to Osaka) as they use their home hub (Detroit, Helsinki) to funnel traffic to Japan. The route will be Kansai's first non-stop link to Los Angeles. The only other North American services (excluding Pacific islands) are United's daily 787 service to San Francisco and China Airlines' three weekly Taipei-Osaka Kansai-New York JFK route (China Airlines will end this in Oct-2014). There were about 137 daily passengers between Kansai and Los Angeles in the year to Jun-2014, according to OAG Traffic Analyser. Of major connecting airports, half of the Kansai-Los Angeles market connected in Tokyo, 20% in San Francisco (on United) and 14% in Seoul Incheon (mostly on Korean Air). Note: Excludes Delta, Hawaiian and JAL, which serve North American island (Honolulu, Guam etc.) destinations. So JAL's route theoretically allows it to capture passengers from United and Korean Air, and possibly those connecting in Tokyo with ANA, although passenger loyalty may limit switches from ANA to JAL. JAL could also route its existing Osaka-US passengers from a Tokyo connection to the Kansai-Los Angeles route with a connection beyond LA. JAL could also route trans-Pacific passengers from other points in Japan (such as from Fukuoka) to the Kansai-Los Angeles route. Even a small shift of passengers from JAL's Tokyo-US routes to the Kansai-Los Angeles route would enable JAL to sell more seats on its Tokyo-US network without increasing Tokyo-US capacity. Point-to-point Japan-US traffic is JAL's main focus for North American routes, but it is also targeting Asia-North America connections. However, JAL has a much smaller Asian network from Osaka than in Tokyo, and JAL's current schedules do not permit it to offer same-day connections from its regional Asian destinations from Kansai (Bangkok, Seoul, Shanghai and Taipei) to the Kansai-Los Angeles route. JAL has also announced plans to retrofit its 787s. The 787s are still young, having first entered into service with JAL in 2012. But the existing long-haul interior, with angled lie-flat seats in business class, was designed last decade before lie-flat seats and mini suites became expected of major airlines. The interior will also end up having a short life due to delivery delays that postponed the aircraft's entry into service. As JAL retrofitted 767s and 777s with lie-flat mini suites, all with direct aisle access, the new 787s ironically started to look old. JAL will retrofit its 787s to the 767/777 standard with "Sky Suites". The first is due to enter service in Dec-2014. Notably JAL will maintain economy at eight abreast, whereas ANA has moved to nine abreast. Likewise on the 777, JAL has maintained nine-abreast seating while ANA has moved to 10-abreast. Overall, JAL is still pursuing a strategy of having a small number of high-yielding passengers rather than a larger number of low-yielding passengers. This also boosts margin, with JAL one of the highest-margin full-service carriers globally. With the 767 and 777 retrofits, JAL says it was able to command a yield premium for the better seat, although did not specify if the premium fully offset the additional cost. JAL's daily 787 flights (to New York and Paris) are often less popular than the daily 777 flights. JAL had reportedly also been considering re-introducing Osaka Kansai-London Heathrow service, but has put this on hold. JAL last served the route in 2009. Although there is not a direct Kansai-Heathrow service, there is greater competition between Kansai and Europe, and JAL would also need to secure Heathrow slots. JAL has also mooted re-opening its New York JFK-Sao Paulo tag flight, ended during JAL's bankruptcy re-structuring. Whereas JAL had used a 747-400, it will now consider a 787. JAL has also mooted an entirely new Tokyo Haneda-Dallas/Fort Worth flight that would serve a growing US business destination, as well as JV partner American Airlines' major hub. American serves Tokyo Narita from Dallas. JAL has not served Dallas from Narita. In the short-haul international space, JAL is also re-opening its Nagoya-Bangkok service, which it last offered in 2004. This is JAL's first new international route from Nagoya in 10 years. Despite JAL's growing international network, with more growth to come, JAL is still about a third smaller internationally than it was in 2009 prior to its restructuring. This has contributed considerably to its renewed profitability, as unprofitable routes were removed, but at some stage JAL will need to recapture a larger international presence. JAL in 1Q2014 achieved stronger international performance than fast-growing ANA, which launched a number of new international routes, mostly to exploit its expanded Tokyo Haneda slot portfolio. 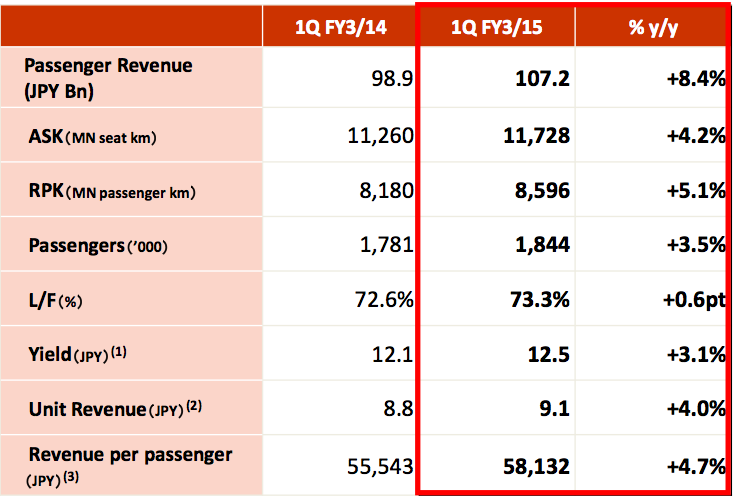 Whereas ANA's load factor and unit revenue declined, JAL posted load factor and unit revenue improvements. 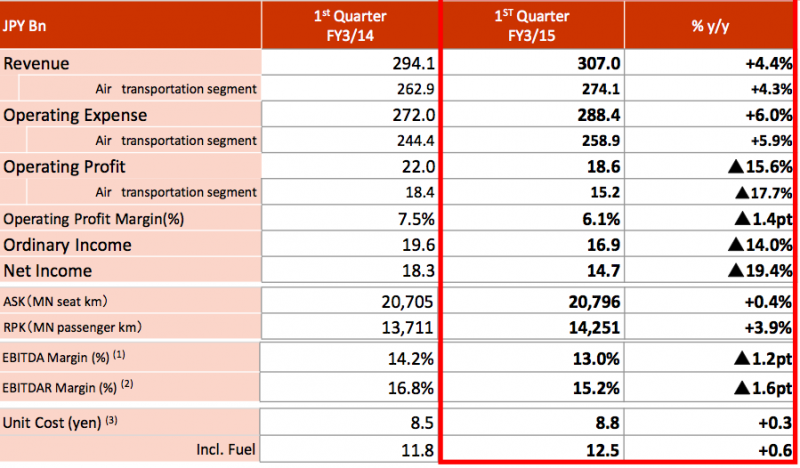 However, JAL's international ASK growth in 1Q2014 was 4.2% compared to ANA's far greater 25.2%. 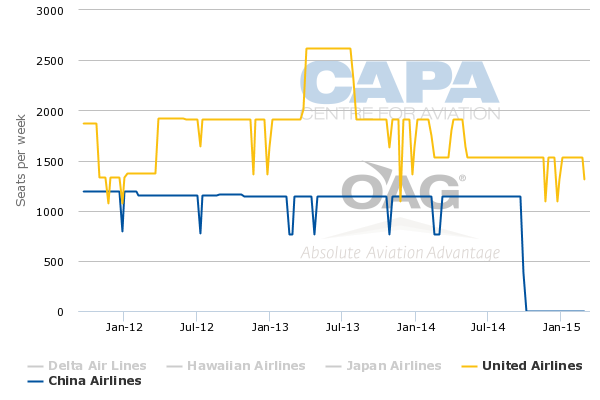 JAL's domestic performance was similar to ANA's with volume and load factor gains but weakening yields due to offering more discounted seats. 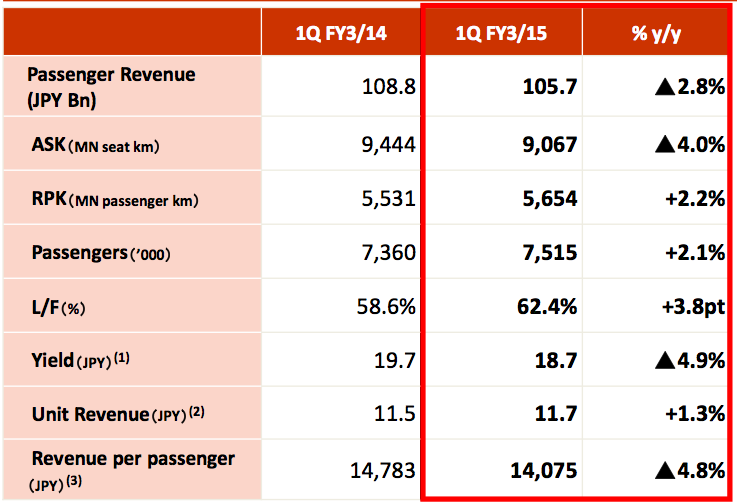 Overall in 1Q2014, cost growth outpaced revenue growth but JAL remained profitable with a 6.1% operating margin, significantly higher than ANA's break-even 0.1% margin. 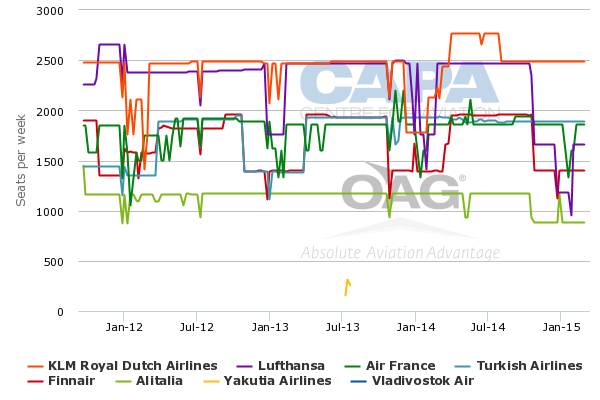 JAL will need to balance international growth with short-term results. ANA provides a contrast in this respect, although it has had a one-off massive growth spurt. In the meantime JAL does not need to worry too much. It generated a 6.1% 1Q2014 operating margin and forecasts a full-year 10.4% margin. If JAL can leverage its partnerships and maintain profitablity there will be little urgency to change course just yet. But in an increasingly competitive growth market it will need to be vigilant in watching for the right time to entrench its position.